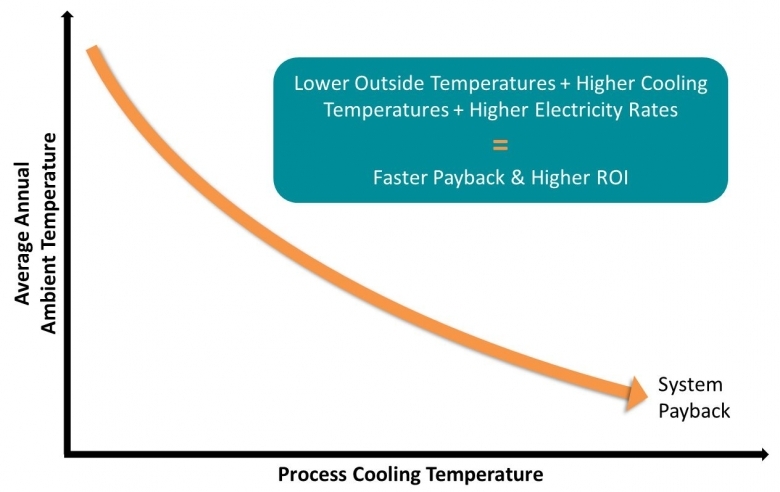 Hybrid Water Chiller | Berg Chilling Systems Inc.
Berg’s Hybrid Water Chiller is the ideal solution for industrial customers that want to lower their electrical operating costs. The Hybrid Chiller provides industrial refrigeration and mechanical cooling during hot weather and 100% Free Cooling during cooler weather, automatically and without compromising production capacity. In a standard industrial water cooled cooling system, chilled water loops cooled by mechanical refrigeration operate continuously. Using Free Cooling, refrigeration compressors can be turned off during cooler months, enabling the outside air to provide system cooling. Once ambient temperatures increase, the compressor reactivates to provide the necessary cooling. Berg’s Hybrid Chiller includes all the necessary monitoring and controls, so the management of free and mechanical cooling is invisible to the operator. 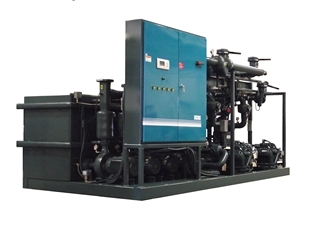 Skid Based Design – The Hybrid Chiller is mounted on a rugged steel frame that is designed and manufactured based on the specific project’s needs. Berg’s skid based design ensures lower overall project capital cost, reduced installation time and minimal operation disruption, shorter time from project kick-off to completion, and ease of maintenance over its operating life. PLC Driven Control – Berg’s System Manager optimises system performance to ensure seamless blending of active and mechanical cooling throughout the year that is hassle free to operators. Factory Tested – Quality assurance testing is completed under design conditions before delivery, ensuring fewer issues during start-up and commissioning. Redundancy – Hybrid Chillers can be designed with independent refrigeration circuits that can provide any required level of redundancy for compressors, fan motors, and when built as a packaged chiller also include standby pumping. Your chiller plant can continue to run safely until components can be serviced and maintained during a planned shutdown. *Evaporator pumps circulate water from the hot well to the chiller and back to the cold well. This provides a constant flow and pressure for stable operation, maximum efficiency and safety. *Process pumps circulate water from the cold well to the process and back to hot well. This flow may fluctuate without affecting the flow through the chiller. *Optional combined standby pump, complete with valved header assembly is capable of acting as either the chiller or process pump if necessary to prevent any unnecessary shut-downs due to an operating pump fault. Frame manufactured from heavy gauge structured steel tube with welded construction. Tank models manufactured from heavy gauge stainless steel. Tank cover manufactured from stainless steel and supplied in sections for ease of removal and access ( Covers are optional ). All tanks have baffled compartments if required. Tanks are structurally supported around top and sides as required. Self-contained controller for fan cycling to maintain set point. All pump starters, fuses, disconnect, control voltage transformer, run and fail lights, are housed in a common NEMA rated panel. This system is used to control the chiller units in a multiple central chilling system. The temperature controller is located at the Berg tank and senses the process water temperature. The process water temperature is maintained by cycling the chiller units. The Hybrid Chiller reduces operating costs due to energy, municipal water usage and chemical treatment savings. Financial return on investment is unique to each specific application, however we have provided systems that resulted in payback in less than two years to data centres, welding and stamping plants, laser cooling systems, die Casting, food and beverage and plastics plants that mold with engineered plastics. Electricity Rates – The higher the cost of energy, the shorter the payback period. BNN: Flaring Natural Gas is a Waste. Time to Cool It. Oil and Gas News - Oil Sands Benefit Canadians Using Berg Chilling Systems Inc.
© 2017 Berg Chilling Systems Inc. All rights reserved. Powered by New Design Group Inc.